remarked that, our amf -was the 0leanegt camp that they had bpan to. .Axnyhow, per labata-Woare -icot in vain. So lt str.ive to have our camp still bettr- next time. jrqir.-.y obBSTVa.trs the CCC work tends to dispel desponden'oy and inatill again abitions into the hearts of the young men in it. One of the leading men of the camp said that us boys are favored in our inspection: We are forewarned. There has been much interest taken lately in High School Correspondence Courses by the men in Oamp. --The third barracks has won Sergeant Abehier's goodwill. --The roads to oap have been builLt. --The basketball team of Co. 1420 has gained renown. --We can hunt deer during the week-ends. --We get the brush-hooking finished. --Cosby and Johnny tell where that particular place is in Ocala. --When Haney tells all about his last Sunday 's trip..
Ma-ion Virginia. Thd:ae papers are on ile in the library. These companies have requested an exchange for copies ,of our paper. Wonder when the dramatics club will give us another entertainment. There have been many improvements made in the library in the last few weeks. The basketball team was making playa on the blackboard last Tuesday might. HUNTERS--Chief Forester Joe McCollough is actively at work forewarltng the hunters of the many CC boys in the Ocala, National Forest. He has had it published in several papers that anyone found using a, gun recklessly will be prosecuted. And also no one will be permitted to hunt within a certain radius of the progeots. It is rumored* that hunting with,rifles in the forest will be prohibited. YOU MUSICIANS--- n'laturse Nook" . again, fellow, '1st es gjzt..going. e that will -ivalithose of a and hz.ve a band. Every body wants airplr'. They are not C:erely .one and wehqve the talt.o why n ying -or are they flitting to etnot have one? hcae esbat ratr tAy . Straed ruts in heavy sand places.- seen'matir.g Auut, . Clearing And grubbing Road #19 Bat aire nfocturna-l in thsir ha75rmiles. bits, hi oin. awvay in the dy time. May, and ieo vries in the South. Ta ,4he little brown bats are as-p artCheiropteral Myoteas Fungitotus, la of t i .r- acaap, an-Hon o itItudintaous Examinonly CAcesid house cat. team to Anthony last Wednesday night and handed them a 24 to 11 licking in the first game of the season for both teams. team found it hard to penetrate Co. 1420's defense and met with no avail when they tried to work the ball through. THE INSPEGTO!ie VISIT Last Monday' morning, our Camp wasinspected' by Major C.P. gross vand 'Captain B'. A. Shipp. The re. 'parts about Camp are that they seemed -well pleased with the app, earahde oi'ths Camp. And one oi th accompanying men is said to' have remarked that our camp was the cleanest camp that they had b^en to. Anyhow, pur labors were not in vain. So lets strive to have our camp still better next time. RADIO CLUB BUILDING Plans have been made for theconstruction of a Radio Club 3 uil^Â•ding. This building is to be a Â’rustic log building, and it is to be for the use. of the boys interested in ra,dio. It will be a place where they can assemble and study and net molest anyone Â’ else-, s-nd whore they wj.11 not be molest. .ed. It was though-t that the work '.on it would; 0 tart last Saturday^ but it was delayed. However it may be sto.rted nest. Saturday Wade, the radio 'nan of 'the. C^xp has been Â’very anxious for, such a' placeÂ’ to carr3^ on his atiudies for several months. It will be an ideal place for code practice. 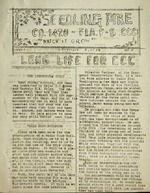 Director Fechner, of the Emergency Conservation Work, in a nation wide address by radio from Washington a few days ago highly praised the work of the Civilian Conservation Corps, and he stated his opinion as being that Congress would pBpvide |u.nds for -the maintainence ^f the Corps until private business usurped the unemployed labor among. young men and Veterans. He pointed,, out that the Corps has not been an expense to the government The value of work that, has been accomplished is of substantial* proportions. He mentioned theother benefies derived frbm CCG; Â• The. developing of selfreliance in the young men of Americaj and their physical developments that Camp, life stimulates; the disciplinary training and the punctual aaily routine; together with the aid given -to. 'home foixa and nen; and t-he va.l-us .of f onec's .preU' :ted from fires uhrougheu-j the nation, e b c ma k e it a s uc c e s .0 f u .1 u.L.d3 r tak4ng. ^BÂ’rqm-my observations the CCC work tends to dispel des-oondenoy and instill again ainbitions into the hearts of the young men in it. Our, Â•a^chievement's will be cited as .reasonst;,o continue the CCGbrps or to discontinue it. So every nan should strive for a goed record that young Amsrica will ha^'e 'Lhe chances : t hat has been ours. THE SEEDLING PINE Page 2 STAFF Editor Aest. Editor Bus Mgr Exchange Ed. Sports Ed. Art Editor Typist Printer Staff AdviserBryant Ayer V/ade Price Duncan Fane her Vanderhoek Ahshire -Wm. A .McCarty THIS Â‘N THAT One of the leading men of the camp said that us hoys are favored in our inspection: We are forewarned. There has been much interest taken lately in High School Correspondence Courses by the men in Gamp. ItÂ’ll be a swell time When.^i Â— Â— The third barracks has won Sergeant Abshier's goodwill. Â— The roads to camp have been built Â— The basketball team of Co. 1420 has gained renown. Â— We can hunt deer during the week-ends. Â— V/e get the brushhooking finished. Â— Cosby and Johnny tell where -that particular place is in Ocala. Â— The t^'-ping students are able to get somewhere before "returningÂ”. Â— When it snoTfs canteen checks that are attached to the book. Â• Â— When Haney tells all about his last Sunday Â’ s t r ip Â• HUNTERS The Company has reoieved copies of the papers of Companies 1217, Ricker Mills Vermont, and I252, Mai '.on Virginia. Tbe.as papers are on file in the library. These companie.s have requested an exchange for copies of our 'paper. Wonder when the dramatics club will give us another entertainment. There have been many inprovements made in the library in the' last few weeks The basketball team was making plays on the blackboard last Tuesday might. Chief Forester Joe McCollough is actively at work forewarmiing the hunters of the many CC boys in the Ocala, National Forest. He has had it published in several papers that anyone found using a gun reckless^J:y will be prosecuted. And also no one will be permitted to hunt; within a certain raddus of the projects. It is rumoredthat hunting with rifles in the forest will be prohibited. There are many hunting camps in in this forest. Two new camps are bein^ r.dded to the fourteen already existing, making a total of sixteen camms. With these facil' ities everyone should enjoy a, good hunting season, if carefulness is Â‘ used. As everyone knows, the hunting season begins on November twentieth Ed.